The Perfect Paint Polish and Foam Pad System for your Dual Action Polisher! You’ve spent plenty of money on the purchase of your car or truck, now the question arises, "How do I take care of it?”. The answer is vital to retaining the value of your vehicle and reducing future costs. This article will help walk through the Pinnacle Complete Paint Care System of washing, claying, polishing, protecting and the final maintaining processes step by step. Don’t worry, it’s pretty easy and you don’t need to be a detailer to do it yourself! Wash – Thoroughly wash your car to remove loose dirt. Protect – Protect the paint surface from harsh environmental elements and prevent premature aging with a wax or paint sealant. The car washing process can range from those who religiously wash or quick detail their vehicles daily, to those who love caring for their vehicle but only get the chance to wash them weekly or every other week. Both categories of enthusiasts cringe at the very thought of taking their “baby” to a car wash, otherwise known as “automatic swirl factories”! The car washing process is the number one cause of swirl marks! This can be avoided with quality car wash mitts, car wash shampoos, microfiber drying towels and a few other important tools as well as a little education. By just following the correct process you will have the know how to wash your car in a manner that gets it clean and reduces the chances of your instilling swirls in your paint. Always wash your car in the shade! Why? Well simple, you don’t want the water, be it the rinse water or the car wash solution, drying on the vehicle. Remember, we are trying to make your car look better than when you started! On that note, if at all possible, try to wash your car on a relatively calm day. You would be shocked at how even a slight breeze can put particulates and dirt into the air. These dust particles are attracted to the wash/rinse water on your vehicle and act like sandpaper when rubbed between the drying towel and vehicle surface. The breeze will also tend to dry your car for you and cause streaks and water spots. 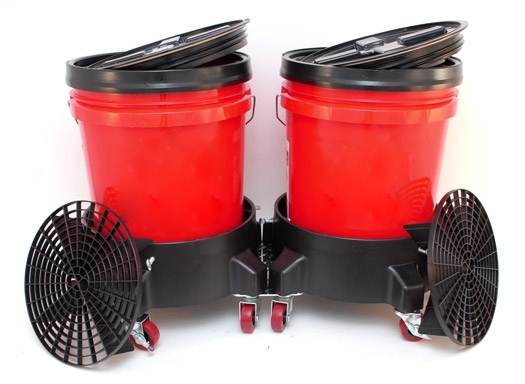 Use two buckets with a Gritguards in each bucket. One is for your car wash shampoo solution and the other is clean rinse water for your wash mitt. Fill a 5-gallon bucket 2/3 full with cool water. Add recommended amount of car wash shampoo to the water. Using a stiff jet of water, fill bucket to fully activate suds. Fill the second bucket with clean, water for rinsing your mitt. Thoroughly rinse the vehicle’s surface to remove the accumulated loose dirt and grime before you begin your car wash procedure. Only use high quality car shampoos and wash mitts. When washing your vehicle remember to always go from high to low, never the opposite. Generally the dirtiest parts of your vehicle are those parts closest to the ground. Wheel wells, rocker panels and bumpers tend to have the largest accumulation of grunge and you don’t want to bring that junk back onto the paint surface and risk scratching it. A trick that I use here is to load up a wash mitt with my car wash solution and wring it out over the wash surface. This acts like a “pre-soak” and helps loosen surface gunk It also adds more sudsy water to my surface. Wash in straight, overlapping lines as opposed to circles and remember to be gentle with the wash mitt on the first pass.. This first pass picks up the initial junk, and loosens the remaining dirt and gunk for pick up on the second pass. Rinse your vehicle by opening up your hose nozzle or removing the nozzle if you don’t have an open flow option and letting water run or sheet over the surface instead of spraying. This helps in two ways. First, generally when water has “sheeted” off of a surface it tends to leave less residual droplets behind. This means less to drying time. Second, since there is less water to pick up, there is less chance of your leaving water behind to “spot” the vehicle. When you dry your car, use only high quality microfiber waffle weave drying towels like a Cobra Guzzler Waffle Weave Drying Towel and wring out often. Gently dry the surface without much pressure. You don’t need to rub the surface…you’re just picking up the bulk of the water! Once you have picked up the bulk of the water, and the first towel is saturated, use a second towel to lightly pick up any remaining streaks or droplets. Lastly, if your wax is still in good shape, go over the vehicle with a quick detail spray like the Ultima Detail Spray Plus and a plush Edgeless Microfiber Quick Detail Towel to restore a radiance and slickness to the paint. This last step will give your vehicle that “just detailed” look by enhancing gloss will also remove any sneaky water spots or streaks that showed up when you weren’t looking. BLACKFIRE Poly Clay Bar quickly and easily removes most forms of paint contamination that is not removed with your normal car wash process. Pinnacle Ultra Poly Clay will remove contaminants like insects, tar, stubborn road grime, exhaust soot, oxidation, pollen, light paint overspray, factory fallout and more! Detail clay can even take care of stubborn brake dust contamination. How do you know if detail clay is what you need? After a good wash, feel the paint's surface. Rough spots and bumps mean contaminants. The BLACKFIRE Poly Clay Bar will clean and smooth your car's paint and get that bonded grime out of the way so you are ready to polish your paint! IMPORTANT NOTE: DO NOT use detailing clay on a dirty paint surface. Always wash your vehicle before claying. Use Pinnacle Ultra Poly Clay only after thoroughly washing your car to remove loose dirt and grime. Flatten half of a bar of Pinnacle Ultra Poly Clay and mold into a flat clay wafer. Lightly mist the clay bar and a 2' by 2' area of the surface to be cleaned with the Pinnacle Clay Lubricant. Gently glide the wafer of Pinnacle Ultra Poly Clay on the surface in a back and forth motion until contamination is gone. Fold the clay bar in half and re-flatten frequently to expose a fresh cleaning surface. IMPORTANT! Discard clay if dropped or when a clean surface can no longer be exposed. NOTE: This clay is soft and should not be used on hot surfaces or when the air temperature is above 84 degrees. In extreme summer weather, use during early morning hours. High humidity conditions may make the bar sticky and difficult to use. You know how you want your vehicle to look but you must also take in to consideration the time involved, tools needed and, if the damage is severe, your own skill level. Now that we know what we have to work with, let’s evaluate the surface of your paint to determine our plan of attack. Now that we know what needs to be corrected we need to choose the proper polish and polishing pad to correct the defects in your paint’s surface and achieve desired results. The Yellow Light Cutting Lake Country CCS Foam Pad is the first step in serious defect removal such as random isolated scratches, heavy swirl, severe oxidation, stubborn water etching and other difficult to remove paint defects. For the worst defects, use Pinnacle Advanced Compound, which is a true polishing compound. If the defects are not as serious, or you're not sure, start with the Orange Light Cutting Lake Country CCS Foam Pad and Pinnacle Advanced Swirl Remover. This combination works on a multitude of paint imperfections. The White Polishing Lake Country CCS Foam Pad is the second step for minor defect removal including swirl, fine isolated scratches, water spots, mild water etching, light oxidation and other less severe paint finish defects. Use the White Polishing Lake Country CCS Foam Pad for safe and complete removal of medium to light common defects with Pinnacle Advanced Finishing Polish. The Green Polishing/Finishing Lake Country CCS Foam Pad is your third step in paint perfection and is used to clean your paint and enhance gloss so you can achieve that desired deep, wet looking shine. Use the Green Polishing/Finishing Lake Country CCS Foam Pad for your final gloss enhancement as well as pre-wax cleaning to prep your surface for proper bonding of car wax, paint sealant or protectant with the Pinnacle Paintwork Cleansing Lotion. With painter’s tape, tape off any sharp edges and trim to avoid staining trim, build up in cracks and crevices and pad damage. Adjust your speed setting according to the “Recommended Speed Setting Guide” below. 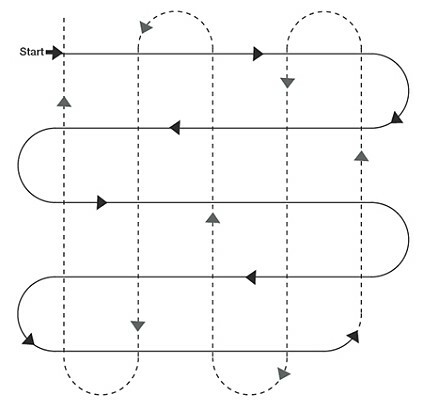 When removing any type of defects apply medium pressure while polishing and move in SLOW overlapping motions according to the “Recommended Paint Polishing Pattern Guide” below. In good lighting, evaluate your work. If it looks like you need to work on the defects a little more, add a few more pea size dabs of polish and repeat your process until your evaluation revels success. (Keep in mind when using more aggressive products you need to work your way down in aggressiveness to achieve your best shine.) Don’t forget, this is a four-step process but you may not need all for steps. Working in sections that are no larger than 2’ by 2’ to concentrate your work repeat the necessary polishing processes over the entire surface of your car until desired results are achieved. Remember areas with more serious defects will require more polishing time so be patient and allow the polisher to do it's job. The charcoal Gray Finishing Lake Country CCS Foam Pad is the final step to a flawless finish and is used to safely apply your car wax, paint sealant or protectant. Use the Gray Finishing Lake Country CCS Foam Pad for thin, even application of Pinnacle Liquid Souveran Wax. Remember to never work in direct sunlight or on a hot surface and make sure your surface is clean and dry. Apply small amount of Pinnacle Liquid Souveran Wax to your Gray Finishing Lake Country CCS Foam Pad. Set speed setting to 3 and spread Pinnacle Liquid Souveran very thin. Using a clean Gold Plush Jr. Microfiber Towel or Bonnets, buff until all residue is removed to reveal that show car shine. Additional layers can be applied after 1 hour. Washing you car often can be very time consuming. For those times when your car is just a little dusty, Pinnacle Souveran Liquid Spray Wax is the solution! For best results, apply to a cool surface and work on a single panel at a time. Just a light mist of the Pinnacle Souveran Liquid Spray Wax (hold bottle 12”-15” away from surface) and follow by a wipe with the super plush Gold Plush Jr. Microfiber Towel.